Available for several sports , with a blank star, or in plain black to add your own design, these black and silver dog tags can be personalized to be used for a keychain, bag tag, or worn on a neck chain. The Volleyball Star Dog Tag features a volleyball framed by the silver star. The Star Dog Tags make a great gift for members of your team or organization. 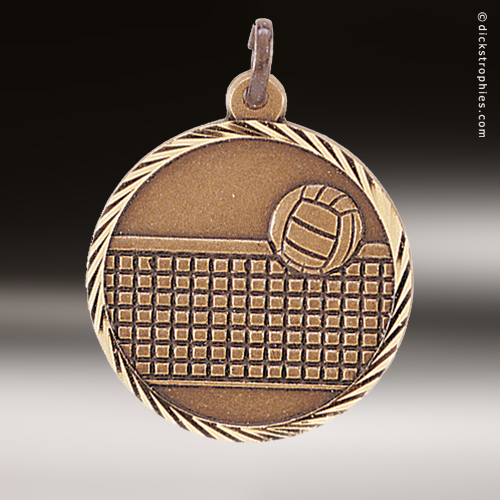 The budget friendly price point on these volleyball medals makes them perfect for those larger events or tournaments where several awards are needed. The medal features a volleyball and net circled by a border of stars and stripes. The ring at the top allows for a ribbon to be easily attached, and the back can be personalized for your event, or to honor the achievement of an individual. This medal is available in Gold, Silver, and Bronze. Brilliant colors highlight this unique volleyball street tag. The street tags are on a highly polished black finish. Set in the center of the tag is an outline of stars with red flames that are set behind a white paneled volleyball and the word "Volleyball" on opposite sides completes the award. This item measures 2 1/2" X 1 1/2" so it has plenty of room on the back for what ever personalization you require. The volleyball street tag can be given as either a key chain or a neck worn award providing you the ultimate in flexibility. Available in Gold, silver and bronze, these sunray medallions are available in two sizes. These medallions include choice of pin drape ribbon or neck ribbon. Engraving on the backside personalizes each medallion. These Volleyball Super Star medals have a decorative star that frames the center of the medal. A multi paneled volleyball fills the front of this 2 1/4" in diameter medal. In addition to many other sports or activities these medal come in your choice of gold, silver or bronze finish. The back of the medal has more than enough room for all of your personalization needs. All you need to do is pick a ribbon and you are all set to go! This stunning medal design features a volleyball scene encircled by a frame of 10 shooting stars. The ring at the top allows it to be easily attached to the ribbon of your choice, and it can be personalized on the back for your event. This is a budget friendly award for excellence in volleyball that will surely be cherished by the recipient. The medals are available in antique gold, antique silver and antique bronze. These volleyball medals have a decorative wreath that goes around the entire medal. It also boasts reliefs of a volleyball and net. These medals come in two sizes 1 3/4" and 2 1/2" in diameter with a gold, silver, or bronze finish and have plenty of engraving room on the back. Just choose a ribbon that meets your needs to complete these awards.